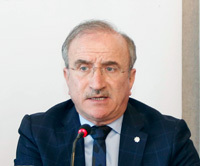 An Uzbek delegation led by the Republic of Uzbekistan Deputy Prime Minister Rustam Azimov paid a visit to the Istanbul Chamber of Industry (ICI). The 24-person delegation was received by Sadık Ayhan Saruhan, ICI Board Treasurer. Present at the meeting that took place at the Intercontinental Hotel were Elyor Ganiyev, Minister of Foreign Economic Affairs, Investments and Trade, Republic of Uzbekistan; Tulkun Safarov, Deputy Minister of Agriculture and Water Resources, Republic of Uzbekistan; Anvar Sharapov, Chairman of the State Tourism Committee of Uzbekistan; Ravshan Gulyamov, Executive Director of the Fund of Reconstruction and Development of the Republic of Uzbekistan; and Saidahmad Rahimov, Chairman of the National Bank of Uzbekistan for Foreign Economic Activity, as well as industrialists from the ICI’s Assembly and Sectoral Committees. “The visit of our President to Samarkand on November 17, 2016 has sparked a common will to further the relations between the two countries. Following this visit, which was of great significance within the context of our close ties with Uzbekistan, we believe that Mr. Azimov and Mr. Ganiyev’s visit to Turkey will be of great benefit. Following Saruhan’s speech, Rustam Azimov, Republic of Uzbekistan Deputy Prime Minister, took the floor. 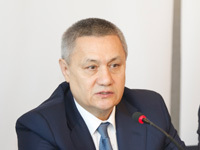 Azimov noted that Uzbekistan, with an economy that grew by 8 percent last year, had shed its dormant outlook of the past. “I would like to note that we are one of the five fastest growing economies in the world. We are a country that has eliminated internal debt through macroeconomic activities and structural reforms, and reduced its external debt to a level around 18 percent of its GDP,” Azimov said. The meeting also saw ICI Member industrialists and guests discuss investment and cooperation opportunities in Uzbekistan.